Throughout the countless years, Hollywood has always embraced social-conscious, race-related dramas in a revealing effort to recreate the turbulent and/or triumphant sensibilities of America's complicated past, present, and possible future. For the most part, cinematic showcases involving racial/cultural strife in the areas of romance, history, politics, friendship, unlikely partnerships, the workplace, and other topical considerations had made satisfying strides in portraying the complexity of the human condition on the big screen. Naturally, some considerable Tinseltown racial dramas elicit an assortment of emotions that convey uplifting, self-reflective, and sometimes disheartening sentiments. Recent examples of heralded conflicted black/white cinema included last year's Academy Award-winning Green Book, the powerfully poignant If Beale Street Could Talk, and the explosive BlacKkKlansmen. Writer-director Robin Bissell makes his directorial debut with the affecting but flatly received desegregation drama The Best of Enemies. Bissell's early 1970's probing period piece tells the heated based-on-the-true-story account of school desegregation based out of Durham, North Carolina and a couple of key players butting heads over this hot topic societal issue. Specifically, the combatants clashing over the controversial stand-off concerning race-mixing and education involved an outspoken community organizer/activist black woman and an intolerable white Klansman. Remarkably, the defiant disagreeing duo would go on to become lifelong friends as their adversarial stances took shape during this ugly, stained chapter in the so-called modern-day South back in 1971. Although dramatically surreal and dripping with ready-made inspiration, The Best of Enemies feels unevenly pat and plays it rather safe without exploring the racially charged obstacles with a more pronounced grittiness. Bissell's oddly "feel-good" commentary on racial redemption never feels daringly subversive or detached in its familiar message on grasping racial unity and conformity. Hence, The Best of Enemies basically resembles a cookie-cutter of other thought-provoking race relation melodramas/biopics we have come across previously. Bessell's insightful exposition means well but the overtones of despair and cynicism seem watered down in its gentle conviction. 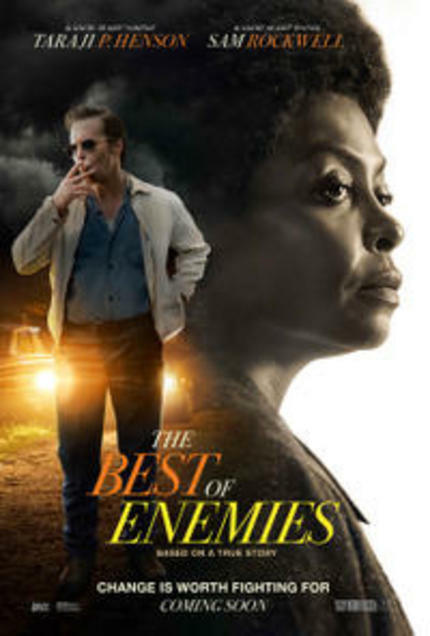 The Best of Enemies is based upon Osha Gray Davidson's book The Best of Enemies: Race and Redemption in the New South. The film's prominent leads in Oscar-nominated Taraji P. Henson (from TV's "Empire") and Oscar-winner Sam Rockwell ("Three Billboards Outside Ebbing, Missouri") as the garrulous black woman advocate Ann Atwater and the confirmed racist white man Claiborne Paul "C.P." Ellis bound by their potent philosophical differences in racial progression (which would ultimately find Atwater victorious in her many struggles to change the corruptible southern school system in her marginalized community) deliver solidly convincing performances that resourcefully register with biting resonance. Sure, there is the obligatory revelation about how humanity can prevail despite its initial roots grounded in sheer ignorance, fear, and a false sense of racial superiority. Bissell's redemptive material never feels as startling and confrontational as it seems to awkwardly hold back its rawness in favor of a preachy, wide-eyed approach to tackling its sense of rightful outrage. Henson's Atwater springs into action when there is a major crisis concerning the burning down of a black elementary school in a heavily concentrated territory where the Klan's influence runs amok. This, of course, begs this reprehensible racial-motivated incident to focus upon the debate regarding school desegregation. Atwater, representing the black community's disillusionment about the incindiary actions of its hateful oppressors, joins forces with a judge-appointed black mediator Bill Riddick (Babou Ceesay) to resolve the existing concerns at large. Thus, a community summit is formed where Atwater and Klan-connected Ellis can collaborate on bringing to the forefront the hostilities that affect both their fractured communities. As co-chairs, both Atwater and Ellis do their share of animated clashing over the need to represent their heavily promoted perspectives actively. The viewpoints are bluntly laid out on the table: immensely beleaguered black targets under racist scrutiny versus the protection of the "poor working white man". The path to racial harmony becomes less rocky as the dueling tandem gradually learn to tolerate each other's seemingly goodness and flaws. Particularly, C.P. is sudddenly open to how relatable Ann becomes to him as she demonstrates a genuine compassion for his disabled son. The film suggests that C.P. Ellis's "awakening" to Ann's caring nature is a revelation worth celebrating because this breakthrough of a narrow-minded white man's intolerance is now retooled for better understanding and acceptance. Can racial reconciliation be the ultimate goal over something as arbitrary as a black activist female having a special regard for her bigoted white adversary's struggling offspring? The Best of Enemies wants to revel in the boiling waters of racial alienation and stagnation but turns around and tiptoes in the trivial lukewarm waves of redemption and realization. Bissell's checkered script does not have a proper balance of introspection to explore what was considered a corrosive crossroad for two opinonated individuals drenched in divisiveness. Sure, Henson's Ann Atwater is a strong and idealistic mouthpiece for the denigration of black existence yet somehow her on-screen impact takes an inexplicable backseat to counterpart Rockwell's C.P. Ellis's metamorphosis from extreme hater to conscientious healer. Bissell takes artistic liberties to manipulate the true story of Atwater's/Ellis's perplexing journeys concerning racial injustice only to produce what amounts to the compulsary pablum of Hollywood's synthetic take on real-life racial rift. Indeed, there is a measured serving of hopefulness about the lessons of connection and compatibility that can be found on both sides of the fence in The Best of Enemies. Nevertheless, the sluggish intentions of its messaging render this Oscar-bait racial drama as a convenient emotional catharsis for the contemplative moment.